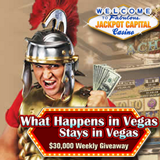 What happens in Vegas happens every day at Jackpot Capital Casino which brings the thrills of Las Vegas to homes and mobile devices all over the world with casino games like Blackjack and Roulette and hundreds of slot games including Cleopatra’s Gold, T-Rex and Enchanted Garden. One thing that happens a lot in Vegas is winning and there'll be a lot of that at Jackpot Capital this month! The popular online casino is giving away $162,500 in free casino bonuses during its What Happens in Vegas promotion and the best news is that it doesn't matter if you play a little or a lot -- everyone can qualify for weekly bonuses. When you play at Jackpot Capital you earn points. Play mobile casino games and you get double points! Every Monday until July 21st hundreds of players will receive casino bonuses based on their scoreboard ranking -- up to $800 each. There will be a final prize draw July 22. You could be one of the 3 players at each of four points levels that will win an additional $500 cash prize. Jackpot Capital has more than 300 games from Realtime Gaming in its online casino and now you can also play 16 of the best ones in its mobile casino. Access the 15 slot games like the new Aladdin’s Wishes plus mobile Blackjack by going to m.jackpotcapital.eu in a smartphone or tablet browser.